Expansive Home in Cascade Village, 5 Min Walk to Chair #20, Perfect for Large Groups and Families! Located in the Cascade Village, this 7000+ square foot European style home acts as a private resort of your own. It is nestled along the Gore Creek and just a 5 minute walk to chair #20 in the Cascade Village. 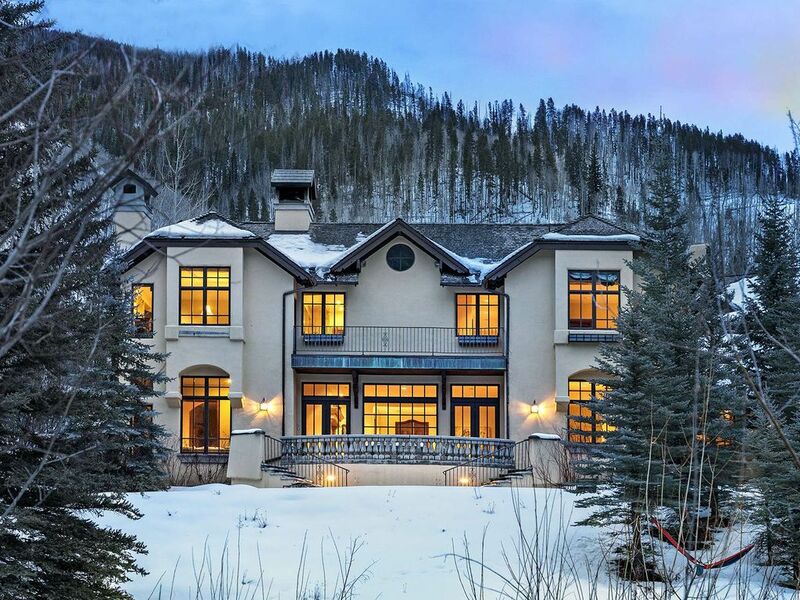 This luxury 8 bedroom residence boasts a gourmet kitchen, parlor, billiard pool table, multiple fireplaces throughout the home (wood and gas), private hot tub, in home gym and large equipment storage room with ample space to get dressed and hit the slopes. There are plenty of gathering spaces throughout the home and enough room if you need to get away from the action to enjoy a little quiet time. Located on the main level of the home is the parlor with wood burning fireplace, billiard room, media room, powder room, living room, kitchen, dining and lower master bedroom with en suite bath. The lower master is furnished with a king bed, seating area for 2 and the en suite bathroom has a deep jetted tub enclosed with glass doors. Head to the upper level of the home to find the upstairs master and bedrooms 3-5. The upstairs master bedroom features a gas fireplace, king bed, flat screen TV and small desk. The spacious master en suite features an oversized deep jetted tub, 2 sink vanities and a walk in shower. Bedroom 3 & 4 are both furnished with 2 twin beds. Bedroom 3 has access to a full bathroom across the hall, while bedroom 4 has private access to a guest bath that features a walk in steam shower and single vanity. Bedroom 5, with queen bed has an en suite bath with a deep soak tub enclosed with glass doors. If you need a little more privacy, this home incorporates a 2 bedroom apartment with a living room (includes springless sofa sleeper), gas fireplace and flat screen TV. Bedroom 6 has a queen bed and bedroom 7 has 2 twin beds. For your convenience, the kitchenette provides a sink, microwave, coffee maker, mini refrigerator and mini dishwasher. The Tower room, accessed from the outdoors, has amazing views from the private deck and features 2 twin beds that can be bridged together as a king upon request and en suite bath with walk in corner shower. This expansive multi level rental home has 12 beds that sleep 16 people comfortably. Most mountain residences, including this property, do not have air conditioning. Fans are provided in the home for your comfort. Please do not hesitate to call or email us with any questions you might have. We represent unique residences from East Vail to Edwards and are anxious to have you as one of our guests. House was great. Rental staff very attentive and our ski trip turned out to be amazing. Frank, it was a pleasure working with you. We are delighted you and your party had an amazing stay at Westhaven. We would gladly welcome you again! I organize a group ski trip every year with family and friends (from 11-18 people). This year we stayed at 1385 Westhaven and we loved every minute of it. A 1-2 minute drive/drop-off to a lift; less than 5 minutes into Lions Head village; another 2-3 minutes to Vail village. The location was fantastic. The house is spacious and had just about everything we could ask for; the kitchen was very well stocked for cooking (often times overlooked in rental houses); plenty of pots/pans/utensils/appliances etc. The ski/boot room was an added bonus; complete with boot/glove warmer/dryers. We had just one minor issue with thermostat that was swiftly and appropriately handled by the iTrip team within a few hours. Would stay her again and would recommend it in the future. Thank you for your review and recommendation. We are very happy you enjoyed your stay at Westhaven and you found the location convenient and the home well stocked for your needs. We would be delighted to welcome you and your party again. Stayed in this magnificent home during ski season in 2016 and plan to do it again in 2017. House is perfect for BIG families or group of friends. The decor is simple, practical and elegant. The social areas are a perfect place for sharing after a long day of ski, particularly the living room in front of the main fireplace. Kitchen is well equipped, with new appliances, including a nice expresso maker. We used, several times, the outdoor jacuzzi to unwind helped with a nice glass of cabernet or a glass of scotch. Rooms upstairs were nice and comfortable, some of them have private bathrooms. House is so big that it takes some hours to navigate and find the correct way from point A to B. In addition, it has a ski room with dryers for ski booths. If you are looking for a place for a large group of people to share and celebrate, either in the Winter/Summer time, this is the perfect place in Vail to do it. Thanks for sharing your home with my family!!!!!! This is the best mountain property all year round!!!!!!. Great location , walking distance to both ski mountain resort and Vail town ,spacious, luxurious and very comfortable accommodations , spectacular views, Amazing experience!!!! !Do not miss the chance to rent it when available!!! The house can accommodate so many people and at the same time everyone has its own privacy. It is the perfect setup for two or three families to enjoy the place. It is amazing. I spent a week with my family and friends in this spectacular property. I will start by saying that the property manager was very welcoming, accessible and attentive to all our needs. Just the first impression of its setting was breathtaking as it is like a Tuscan Villa in the middle of Vail woods. It is located in a very quiet residential street with a river in front of it and a three minute walk from the Cascade hotel and lifts (if you go skiing) and a short splendid walk to Vail city center and Lionshead if you just want to wander around. The rooms and decor are in accordance with this type of luxurious villas harboring different “atmorpheres” in the several cozzy living rooms, library, and even a pool table next to one of them. The kitchen is extraordinary, conveniently located in the ground floor with all the tools and gadgets you can think of. The dining room is next to the main living room and to the kitchen and is one of the most magnificent areas of the house. It has a large dining table which was perfect to enjoy all meals with the family and friends. The rooms were clean, spacious and in excellent conditions and equipped with everything you may need (bathroom vanities, towels, linens, etc, etc) just like any “Relais and chateaux”. There is also a very good “wifi” covering all areas of the house. There is also a fantastic huge hot tub-jacuzzi in the garden which we found very convenient and we enjoyed daily when coming from the very cold weather outside. I have not seen a more spectacular villa in a ski resort and I can not overemphasize on the beauty of this place. If you are looking for beauty, luxury, comfort and service, this is as good as it gets and it is in a league of its own ‼! We can’t wait to come back again in the near future.